The club has missed Sandy during the second half of the season, though we appreciate the attractions of cruising around the world. Needless to say, with half an eye on next season, he gives high priority to his table tennis practice. Playing conditions on the ship are good but not quite to the same standards of excellence as at the Victory Memorial Hall. 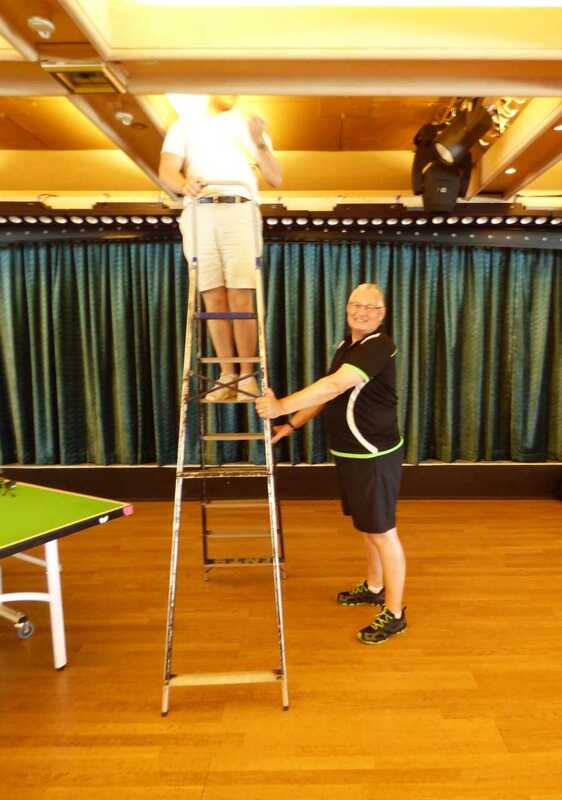 The low ceiling on the cruise liner requires a periodic rummage in the lighting gantry for all those smashed balls which didn’t quite connect. Naturally we feel very sorry for the opponents who had to cope with Sandy’s smashed balls which did connect. Below is a picture of Sandy having a knock with his playing partner on St Patrick’s Day, with a hint of green on his clothing and more than a hint on the table. Given it was 32 degrees centigrade outside in Kuala Lumpur, Sandy was grateful for the onboard air conditioning. 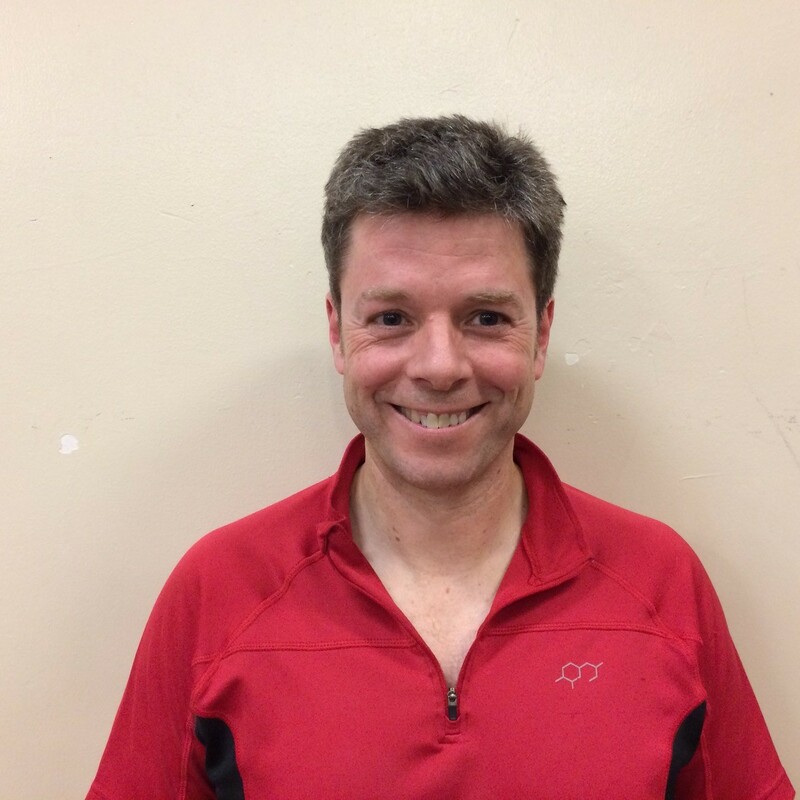 This entry was posted in St Andrews Table Tennis Club on March 28, 2018 by standrewstt. Prefects were looking for a strong win in their final fixture against Rockets to make their claim for 5th place in Division One of the Dundee and District Table Tennis League. Despite a hat-trick of wins from Michael Hahn, a 6-4 loss means they will probably have to settle for 6th place. Sascha Roschy’s three games all went to a fifth set, but he was only able to beat Gary Lowson, losing to Jim Dyson and Peter Dixon, the latter being a particularly close 11-9 loss. Clyde Johnson unfortunately couldn’t pick up any wins. Truants managed a 5-5 draw with Viscounts. Sascha Roschy lost only his second singles game of the year in Division Two with a reverse to an in-form Andrew Nimmo, who was undefeated. Both Sascha and Graham Wood managed strong wins against Jacob Munro and Filip Jovanovic, and joined forces to beat Andrew and Jacob 3-2 in the doubles. New Kids had a strong 6-4 win against Rollercoasters, although no player was undefeated on the night. Howard Lee beat David Lane and Tony Cook, but lost to Paul Jackson, while Ian Smith lost to David but beat Tony and Paul. The pair of Howard and Ian managed a 3-1 win against Paul and David in the doubles, while Kong Wan secured a good 3-0 win against Tony. 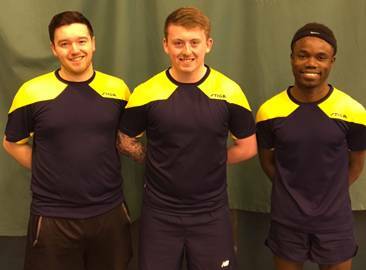 Swots had a close fixture against Chieftains, losing 6-4, with each team winning two five-set games. They were unfortunate at the start of the night, losing the first two games 3-2, Emma Bissett to Jacob Munro and Collin Bleak to Fiona Kinloch. Things went from bad to worse as Dave Beveridge lost 3-0 to Jim Tawse and Collin lost 3-1 to Jacob, losing all three sets by the minimum two-point margin. However, Swots then mounted a comeback, winning four of the remaining six games. Emma beat Jim 3-2 but Dave lost to Fiona 3-1, leaving Swots fighting for a draw. A strong doubles win for Emma and Collin against Jacob and Fiona was followed by a 3-2 win for Collin against Jim and a great 3-1 win for Dave against Jacob but unfortunately Emma could not complete the comeback, losing out 6-4 to Fiona. In their second fixture of the week, Swots drew 5-5 with Lundin Links. Nick Shepherd was the star for Swots, winning a hat-trick for the loss of just two sets. Collin had a very narrow win against Roman Nydza, scraping through 13-11 in the fifth set, while Dave lost all three of his games but did well to pick up a set in all three. A good doubles win for Dave and Collin proved decisive in the overall draw. Prospects found their fixture against Kingsway tough, losing 9-1. Ian Brumwell had a comfortable 3-0 win against Alan Carrie but Dave Goddard and Neil Lea could not add to the score. Two St Andrews players, Michael Hahn and Sascha Roschy, represented the Dundee League in the annual Scottish Inter-League competition this weekend in Perth. Sascha contributed to a great 3rd place finish for Dundee ‘A’ in the Veteran Men’s event while Michael played as the number 1 player for Dundee ‘A’ in the Senior Men’s, with the team managing a fantastic 2nd place finish against some strong opposition, losing only to West of Scotland and coming through in no fewer than three 3-2 team matches. 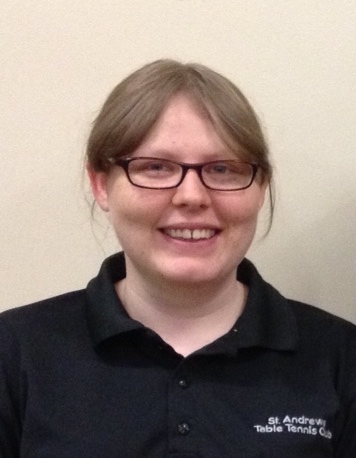 This entry was posted in Match reports, St Andrews Table Tennis Club on March 28, 2018 by standrewstt. Swots continued an excellent run to reach the final of the Handicap Cup in the Dundee and District Table Tennis League. They managed to beat Chieftains 10-7. Emma Bissett won 3 of her 6 sets, and Dave Beveridge 2 of his 5, but the star of the show was Chris Wroniecki, playing up for Swots, who won 5 of his 6 sets. Being poised at 6-6, Chris beat Jim Tawse 2-0, also winning on actual points played, to give Swots an 8-6 lead. Emma drew 1-1 with Jacob Munro to set Swots up 9-7, before Dave finished matters off in the first set against Fiona Kinloch 21-19. Swots’ league match did not go the same way as the trio of Emma, Dave, and Nick Shepherd lost 8-2 to a strong Villa side. Nick won 3-0 against Ian McLagan and 3-1 against Sandy Bertie, but David Hay was too strong for all of the Swots players, not dropping a set. Dave Beveridge was unfortunate not to beat Ian, losing 3-2. Prefects had a strong 9-1 win against Thumpers. Michael Hahn and Justin Yang were unbeaten; Michael only losing one set, to Tony O’Shea 12-10, but only lost 11 points across the other three sets to assert his dominance. Justin beat Tony 3-0, but lost a set against both Ian Hunter and Jordan Ednie, the latter being a particularly entertaining match. Clyde Johnson eased past Ian and recovered after losing the first set to beat Tony, but lost 3-1 against Jordan. Sascha Roschy was back in action after an injury this week for Truants, not losing a set in his three games against Jill Milne, Dougal Ogilvie, and Glenn Christie. Alain Leger was also undefeated, losing one set each against Jill and Dougal, and teamed up with Sascha to win the doubles. Knut Radmer added a 3-0 win against Jill, and was unlucky to lose 3-2 to Dougal, losing the last two sets 12-10. New Kids lost a close match against Chieftains 6-4. Ian Smith beat Jim Tawse 3-1, while Howard Lee also beat Jim and had a good win against Jacob Munro 3-2, coming through a close fourth set 16-14. Howard and Ian also came through 3-2 to win the doubles against Fiona and Jim. Prospects had a tough game against Princes, losing 8-2. Chris Wroniecki beat Eddie Dougan 3-0 and teamed up with Ian Brumwell to beat Blair Duncan and Chris Riddoch 11-9 in the deciding set. Ian was unlucky not to win any singles games, losing 3-2 to both Chris Riddoch and Eddie. This entry was posted in Match reports, St Andrews Table Tennis Club on March 21, 2018 by standrewstt. The red weather warning and alpine-like conditions of last week brought St Andrews to a lockdown with the University and many businesses closing for large parts of the week. As a result, many of the matches in the Dundee and District Table Tennis League were postponed. However, some of the matches earlier in the week were played, and St Andrews’ Monday home night saw two fixtures before any sign of snow, and Prospects managed their away fixture. Prefects got a strong 8-2 win against Telstars. Michael Hahn and Clyde Johnson both won three games losing a solitary set each, Clyde to David Monteith and Michael to Ian Farquhar. Michael and Clyde won the doubles against David and Ian 3-1 and were always in control of the game. Bonifac Legrady won his first game of the season 3-2 against Stewart Clark and came close in his other two games. First he lost to Ian in a close three-game encounter, and then his game with David went to a fifth set. Bonifac led 5-1 before David started a comeback and eventually won 13-11. On the other side of the hall, Swots got a strong win against Rollercoasters in a close fixture. 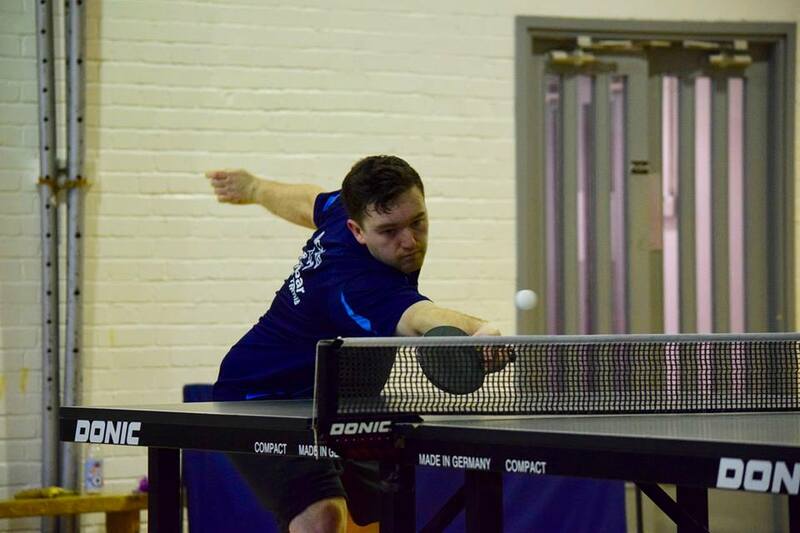 Dave Beveridge started with a dominant 3-0 win against David Lane before both Collin Bleak and Emma Bissett were beaten in close five-set games against Paul Jackson and Scott Thompson respectively to give Rollercoasters a 2-1 lead. Collin was again forced into a fifth set, but this time was successful against David to level the score but Dave was then beaten 3-0 by Scott. A 3-1 win for Emma against Paul and 3-0 doubles win for Dave and Emma against Paul and Scott put Swots 4-3 ahead, but a third win for Scott, this time against Collin, levelled the score at 4-4. Emma beat David 3-1 to give Swots the advantage and Dave defeated Paul by the same score to give Swots the overall victory. Prospects unfortunately could not follow suit, losing 9-1 to Sputniks. Neil Lea and Dave Goddard were both beaten by the trio of Jack Oughton, Carol McLean, and Eric Brown, although Neil managed to win a set against Eric. 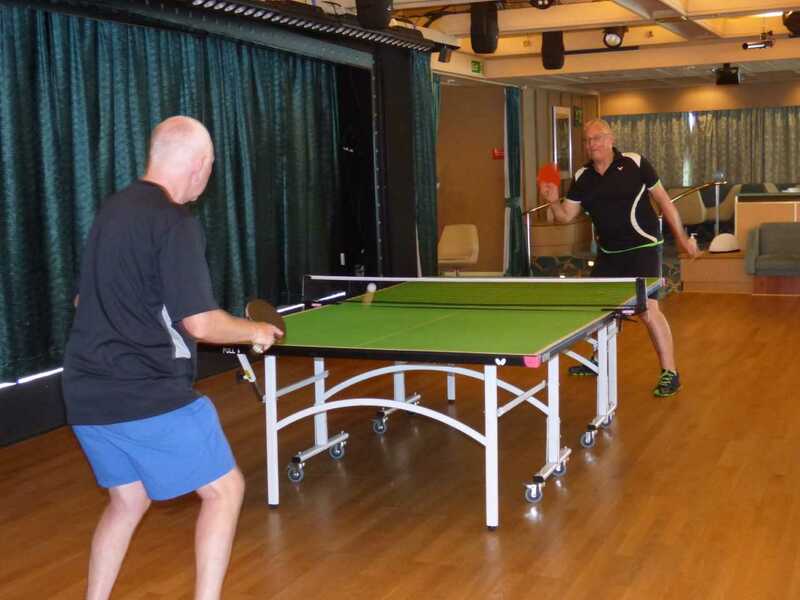 Ian Brumwell’s performance improved as the night went on and he managed to win a set in the doubles alongside Dave against Carol and Eric before beating Carol 3-2 in his last game of the night. This entry was posted in Match reports, St Andrews Table Tennis Club on March 7, 2018 by standrewstt.